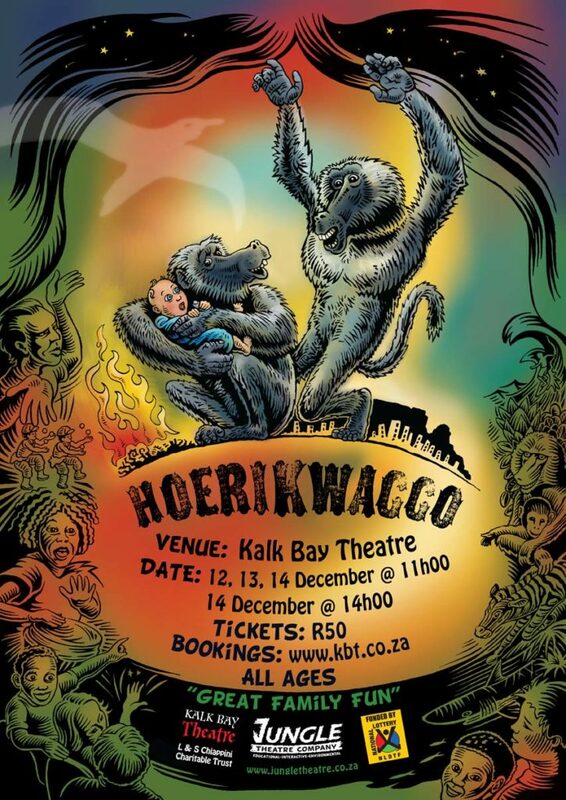 Hoerikwaggo tells the story of Knuckles and Smiley, two young baboons who are sent on an adventure from their home in Cape Point all the way to Table Mountain, on a quest to return a human baby to its family. Leaving the safety of their range, the trailblazing baboons embark on a hilarious journey, encountering other creatures, unique plants and heritage sites. They discover the beauty and history of the peninsula with the help of a seagull guide. Hoerikwaggo is a fun; interactive, educational play focusing on the importance of the Table Mountain range as an example of biodiversity. The play concentrates on the natural environment with particular focus on indigenous flora, the diversity of animal life and broaches: fire prevention; baboon management; protection of species; fynbos and biodiversity awareness; the importance of alien clearing and cultural heritage. Hoerikwaggo is a trilingual production that draws on local archetypes and characters and uses comedy; song; dance and audience interaction to provide engaging education. Hoerikwaggo is 55 minutes in duration and is suitable for Grades 4-7. An accompanying drama skills workshop of 45 minutes is also available. Hoerikwaggo was created in 2005 in conjunction with Table Mountain National Park (TMNP) educators to develop a curriculum relevant show and workshop for the intermediate phase. The play has toured schools and the National Arts Festival and was incorporated into TMNP ‘Kids In Parks’ schools outreach programme in 2006, 2007, 2009 and 2010. Hoerikwaggo was performed for Kirstenbosch National Botanical Garden’s Biodiversity Expo in 2010 and 2011. Hoerikwaggo returned to the stage in 2013 with a school tour and public run at Kalk Bay Theatre followed by a school tour and public run at the Masque Theatre in 2014. Hoerikwaggo was re-cast and performed at the Langa Civic Hall for learners from Langa and Kalksteenfontein primary schools in October 2015.